We are scientifically wired to like symmetrical faces. Now, apply this postulate to architecture and you will know why Durham Cathedral got my full attention. 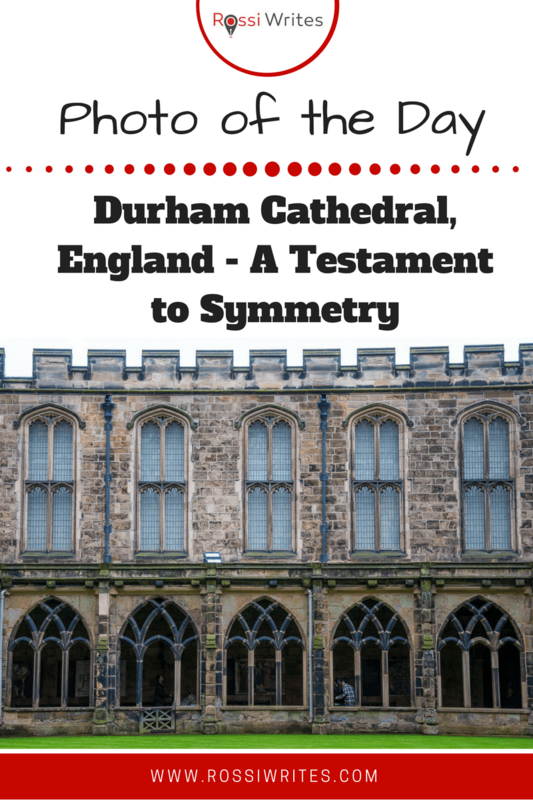 Its imposing symmetrical body has been gracing Durham’s skyline since the end of the 11th century. Widely recognised as one of the most important religious buildings in the UK, Durham Cathedral is also a UNESCO World Heritage Site. Pictures inside are not allowed, so today I will regale you with this shot of its cloisters. We visited Durham Cathedral this summer. in the North of England which, apart from its Cathedral, is also famous for its University. The latter is one of the Top 5 Universities in the UK alongside Cambridge, Oxford, St. Andrews and Imperial College London. The city’s cobbled streets are a joy to explore with their cute little shops and whimsical eateries serving generous portions of imaginative fusion food. There is also a castle – a proud Norman building – which nowadays is used by University College (the oldest college of Durham University) to house students and the college library among other things . and with its centuries-long history, it attracts pilgrims and tourists eager to see it. Its building is deceptively simple. The more you look at it though, the more details you start to see. Plus, the stunning stained glass windows add a jolt of colour to its darkened stone walls. crenelated edges at the top. in order to slot into one another so effortlessly. Their seemingly endless repetition creates a very pleasing for the eye effect. It is all so simple, so streamlined and quite severe, if you like. Yet it achieves a look of lightness which guides your gaze up towards the sky. So, this is the story behind today’s Photo of the Day. I hope you enjoyed it! If you have been to Durham Cathedral, let me know the feelings and the impressions it left you with. Otherwise, I will be curious to read which other place you found irresistibly symmetrical and beautiful in spite of its apparent severity. For more stories and photos like this you can follow me on Facebook and subscribe to my weekly strictly no-spam newsletter.